The bio team, like most teams at EG, has been reworking its curriculum since I joined it three years ago. The largest changes have been with our learning targets and our grading practices. We are always trying to figure out both what we want students to master and what that mastery looks like. We recently worked together during a pull-out day and examined our curriculum on a more global scale. Our collaboration led to great questions and conversations. For example, why do we have a "scientific method" unit? Doesn't this unit include the skills that should be developed throughout the year and not just in small doses? Isn't our course supposed to be a year long investigation into the process of science that is just driven by principles in biology? How often should we be assessing skills related to experimental design and analysis? What are these skills? How often do we have labs where we practice these skills and how are we providing feedback on them? Should large themes like change over time (evolution) be taught independently or weaved throughout the year as an important overarching reality of the world around us? It was great to have this open dialogue and it really helps reset our priorities in a science classroom. We spent the beginning of the day agreeing to eliminate our independently taught scientific method unit. Instead, we would use our standards based rubric that we developed as a way to constantly assess on science skills throughout the year. 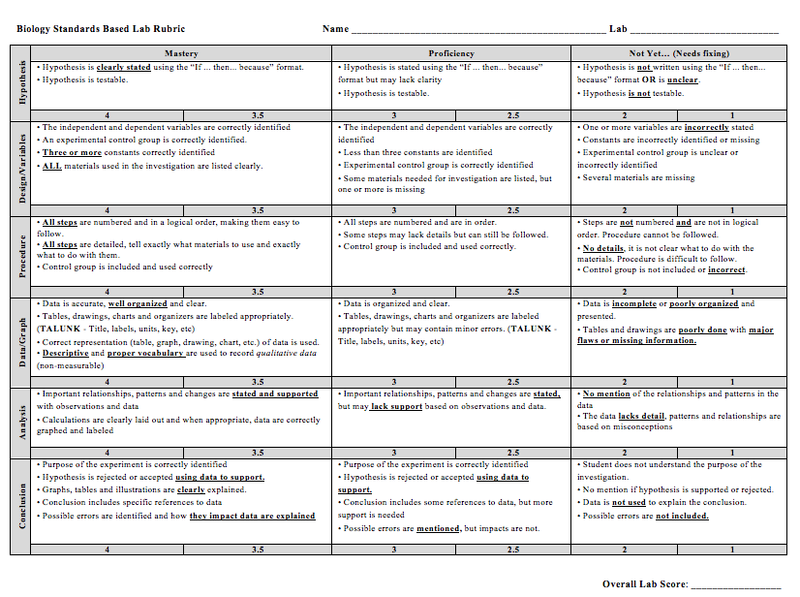 By using this rubric, students can track their progress throughout the year on important lab skills like procedure writing, graph making, and conclusion writing. 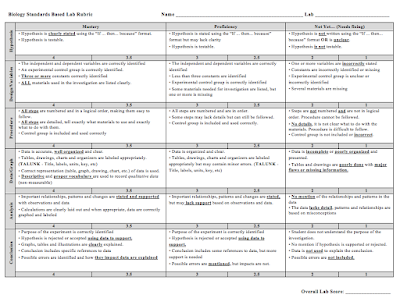 This rubric format was modeled off of what Kim Miklusak and the English team use for writing. On top of re-evaluating skills in the classroom, we re-worked our content for the year as well. This included re-writing learning targets so that they are more student friendly and re-structuring so that large themes like evolution, energy/matter flow, and interdependence are interwoven throughout the year. What part of our brainstorm looked like in the Collab Lab. The biggest challenge still, in my opinion, is how to connect progress and student mastery in the grade book. This is what I consider to be one of the biggest "growing pains" of our transition to standards based grading in biology. As a team, we are on the same page as to our targets and what mastery should look like, but are our students? How are we weighting formative and summative assessments in the grade book? How can we make a student's progress throughout the year clear and understandable? What's the best way to communicate this? Finding solutions to these challenges is the next step and will help make reassessment more efficient and hopefully increase student ownership.